This is once again aimed at DE'er's in and around IN. 1) Replace the tongue & groove wood inside the exterior wall where Terra rides in the trailer. The wood is rotting, and the padding nearest the rear of the trailer along that side has come loose. 2) Renovate my trailer with some sand blasting, a new paint job and some minor interior work (like that pesky sidewall). It's starting to rust with some pinholes in some places, but the floor and the underside is still in good shape. Just the body is starting to go. 3)Buy another trailer either new or used, but I'm not rich by any means. I've already discovered there isn't much out there in the 4 to 6 thousand range, and I can't afford much more than that. NOW! There's a place not far from me that wants to build me a new horse trailer for around 5 grand, but I'm afraid it will be more like a converted stock trailer, though they have promised I'll have a drop ramp like I have now. The thing is, they don't specialize in making horse trailers, and I'm afraid there won't be anything between the horse and the trailer shell. It will have a dressing room also like my old trailer. I know this sounds good, but something keeps alarm bells ringing in my head. I'm so afraid if they build me a new trailer, it won't be what I expect. Does that sound crazy to you ? They also do renovations but said it could cost up to $3000 to do so from what I've told them about my trailer. They haven't seen it yet. I've looked online, but there's not much to choose from and not many in IN let alone NE IN. We went to Kerlin's near Silver Lake this afternoon, and was shown a new trailer that would probably be like the one the place near Markle would build for me. The one at Kerlin's is a 2-horse bumper-pull. There's wood covering the inside of the door where you load the horses but nothing on the sides. It's a slant-load steel trailer, but that doesn't bother me. All my trailers have been steel. The dressing room isn't quite big enough for my twin sized air mattress. Just a bit smaller than my present trailer. So, my fellow Indianans; Any tips on trailers for sale that might suit my needs? And, of course, any advice from the rest of you would be greatly appreciated on what I should do. I guess I should add that if I don't find anything before then, I can always drool all over the trailers at the HHF in early April. LOL! Who knows? Maybe I'll find a bargain there. Unless a terrific bargain comes along, I think you would definitely be ahead by waiting until the HHF. Even if you didn't buy one there, you would at least be able to see a good many trailers in one location, and get a feel for what might work for you, and price ranges. I wanted an aluminum over steel trailer, and they are more pricey than all steel. But, while looking, I DID see a steel trailer that I seriously considered buying. I belive it was a CM trailer. It was very reasonable, too. The dealership where I saw it, usually comes to the HHF every year. Have you tried advertising in Craigslist for Indiana and surrounding States for "Wanting to Buy" and just putting in what you're looking for? There might be something out there in someone's yard that they haven't gotten around to selling, or is waiting for the time to sell. Just a thought...folks do that all the time up here. I'm thinking that your instincts about the "alarms" are spot on. They're quoting you $ amounts with not having seen your trailer? Hmmmm...seems expensive too. If your trailer has good floors and undercarriage and you like the basic design and layout the cheapest option would be to give it a face lift. I suggest that you take the trailer to a few different auto body repair shops and get some estimates. If they don't do that sort of work perhaps they can recommend some one who can or one of the guys at the shop may take it on as a personal project. If you do it right away and give them some extra time they can do it as a fill-in job and you may be able to get a better deal. Of course, new trailers are tempting, but trust your instincts about buying only a brand name one. Ginger, I bought my trailer at the HHF in 02. I purposely waited for the HHF as I knew there would so many dealers there and I could shop in one spot. I spent an entire Saturday checking out all the dealers and walking through trailers. Like you, I had a basic list of 'must haves' and a very limited budget. I ended up with my 3-horse slant, stock type with dressing room. I custom ordered it from the manufacturer through the dealer. It is a base model with only one upgarde, the window in the dressing room. I am VERY happy with the trailer, it pulls great and has transported my horses safely to many, many rides. I ordered my trailer at the HHF, too, with some modifications, and I've been quite happy with it. Plus, it was just fun to look! Probably a once-in-a-lifetime thing for me, but it really was a thrill at the time! I'd say trust your instincts especially with limited budget. If they don't have any examples or satisfied customers, you could end up very dissatisfied and no money to fix it. Wait for the HHF. They might get some trade-ins there and be interested in a quick turnaround sale. I agree with your reservations about having one built by someone who doesn't specialize in horse trailers. I would not want to be a "learning experience" for them. Personally, unless you are wanting a trailer with living quarters, I think your biggest bang for your buck is in stock type trailers. Corn Pro makes a great trailer at a reasonable price, and stock trailers can be very versatile, and can be used for many things besides just carrying your horse, for example, hauling your hay, moving your friends and relatives far far away, etc. Of course, if that is not what you have your heart set on, it doesn't make any difference. As far as new trailers, I think you can get a good buy with some of the specials they run at the horse fair. 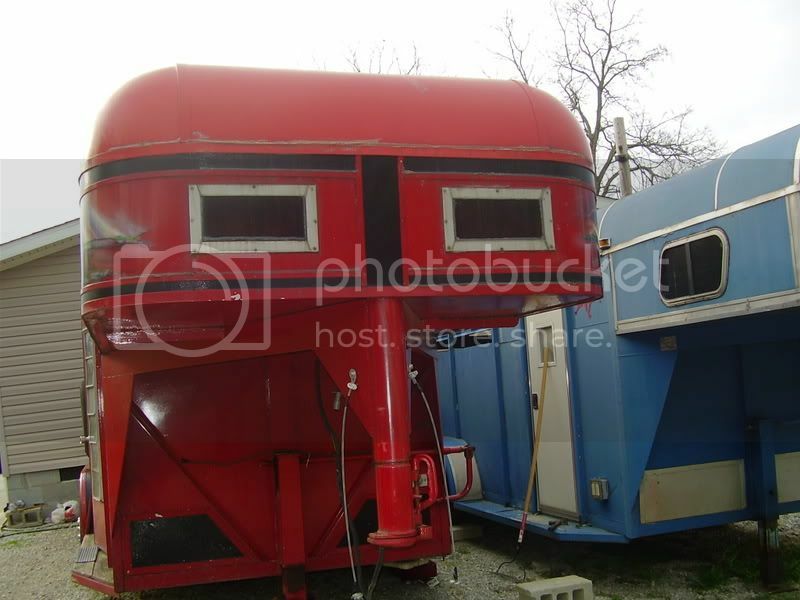 Ginger, my friend Maria is selling her red LQ two horse trailer for $4,000. It is nice. 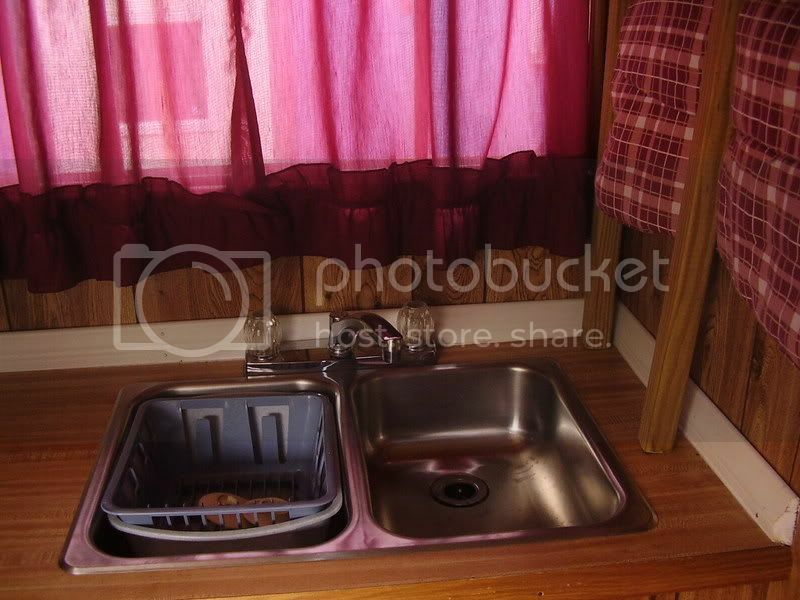 It has a shower, AC, cook stove, commode, sink, etc. I can send you pics if you're interested. If you know how to listen, they will tell you many things. Sorry I'm so late in responding to this, but I have been giving everyone's advice serious thought. I am planning on going to the HHF. We got our tickets in the mail last week. I also checked Craig's List a couple of times. Sorry to say that there wasn't much there. I need to check again in case something has popped up. The estimate at the place near Markle was a guess. They said they would have to see my trailer before making a positive estimate, but the minimum cost is 2 grand for sand blasting and painting. Anything else is extra. I hadn't thought about taking it to body shops. I tried that with a trailer many moons ago. Most places wouldn't even consider taking on a trailer, and the cost was about the same as what I'd fork out for another trailer with mine in trade. Of course, I was looking to buy my first WW at the time, and they're no longer in business . They were cheap trailers, but just what I wanted. I should add that the place near Markle does build stock trailers... very nice ones, but I don't like the bang & clang or the full back door. I'm sure what they have in mind would be a stock converted to a 2-horse slant with a combination tack and dressing room. They didn't say they have or have not built one like this, but I saw none in the lot. 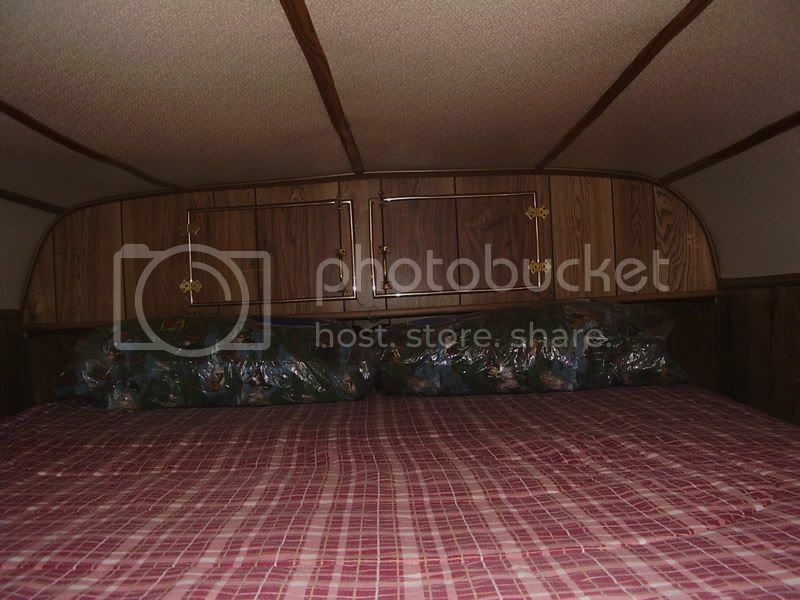 Appy; That trailer is a steal for 4 grand from what I can see in the pics. The thing is that I would be hauling by myself. Also, except for my few trips to southern IN, I pull mainly to Salamonie to day ride on the weekends. I'm also concerned with gas mileage with the way the gas prices have been and would have to convert my truck to pull a gooseneck. There's also the cost of maintaining the LQ. Don't get me wrong. I'd love to have a two horse goose with LQ... but I just don't know if it would be feasible at this time. Tell Maria if she gets a buyer, sell the trailer. That sure is a bargain, and thanks for thinking of me . Like I said in the Saddle Shop Corral, I went trailer shopping at the Hoosier Horse Fair and came up empty. So Steve & I went back to Zahm's Trailer Sales this morning. I got to thinking and began adding up the years. I've done business with Zahm's for 40 years!!! I couldn't believe it had been that long. Bill Zahm laughed at me when I told him this and said, "Scary, isn't it." 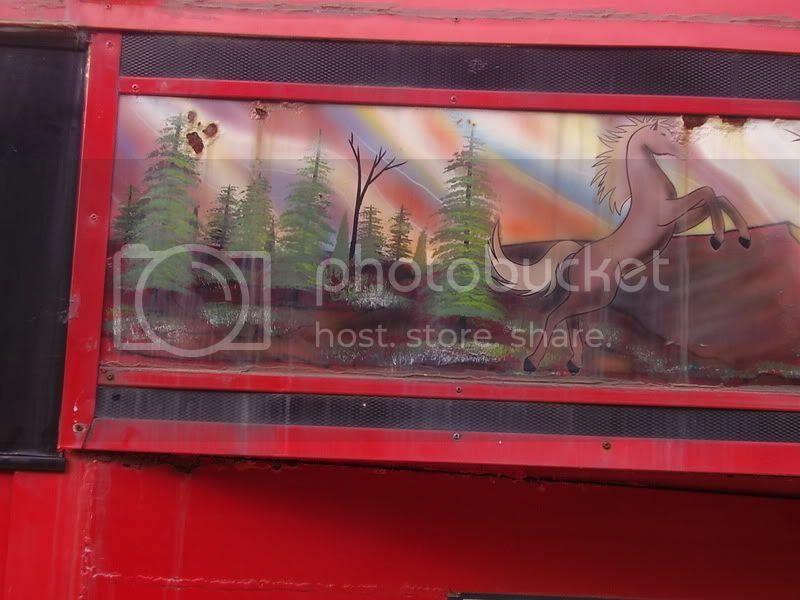 I bought my very first horse from them in 1970 and every single horse trailer I've ever owned. I had some questions to ask that came up when talking to the horse trailer dealers at HHF. Come to find out I had some of my facts confused on the trailer we talked about last Friday. First; it's an all steel and not aluminum, which doesn't bother me since all my other trailers have been too. 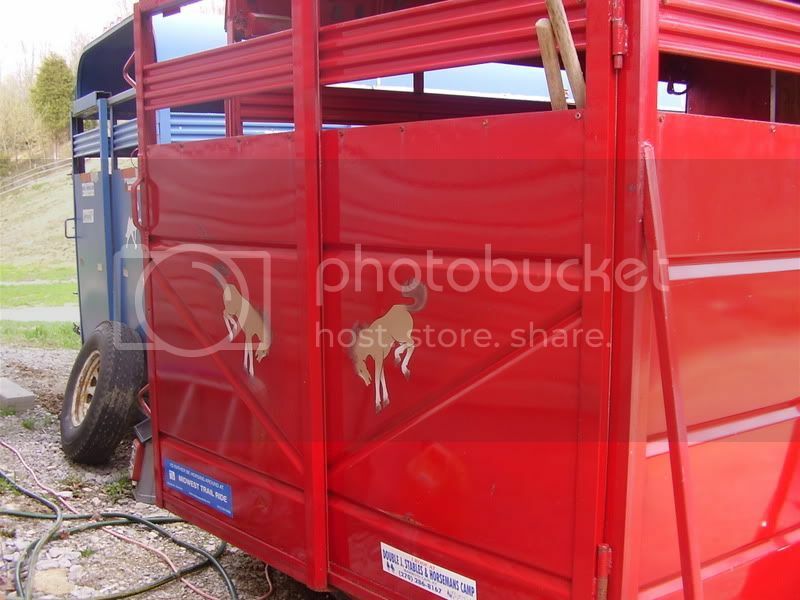 Second; it's a stock trailer that's more like a horse trailer. It has a full back door with a drop bar much like my WW, though the WW has two doors instead of one. It's a 3-horse slant with a dressing room. The saddle racks are in the dressing room and swing out for easy access. Instead of the typical stock trailer walls, the side the horses will face has drop down windows just like a regular slant load horse trailer. Only the side nearest the horse's rump looks like a typical stock trailer. I was surprised to find out that Corn Pro makes this kind of a trailer, and it's within my budget at $7,000 with my old WW in trade. I'm getting $800 out of the WW, and that's not bad for the condition it's it. I had two color options and went with a dark beige. It was either that or gray. My WW is gray, and I thought it time for a different color after towing the WW for 14 years. LOL Also it should go well with my dark red Silverado. Now here's the neat part: They will convert this 3-horse into a 2-horse so I can have a larger dressing room to camp in, just like EZ had done with her American Spirit trailer. This means that I won't get my new trailer until eary June since it'll be made-to-order. It might not be fancy, but I'll take practical over that any day of the week, and I feel like I've made a good deal. I am sure it will fit your needs nicely, since you are having it made the way you want it. Can't wait to see it, and/or pictures. I bet you are anxious, too! How smart you are to investigate your options further!!! Sounds like it'll be perfect, can't wait to see the pics when it arrives! WOOHOO! Congrats, Ginger! Looks like none of us will be staying in cabins anymore. "And anyone who calls on the name of the Lord will be saved." Sounds like a great trailer tailor made for you. Our 1994 Sundowner is a steel trailer and is still in pretty good shape. One thing that contributed to it's life is that we had it rust proofed when it was new. Had all the hollow steel tubing and frames done inside. Since you keep your trailers a long time this might be worth exploring. The drop-down windows on one side and stock on the other side is a good combination in my opinion, it's what I went for. Less likely for stuff to blow in the horses' faces, but still the ability to have lots of air circulation on hot days. And what a great idea getting a bigger dressing room since it's possible; those things always fill up with "stuff" WAY too fast! I think you'll enjoy this trailer a lot! Yah for you Ginger! How many days until the new trailer arrives? Congrats! I was planning on getting myself a new one this year but it doesen't look like it is gonna happen, but thats OK there is always next year!! Yep, Tuffy, it will look something like that on just that side only longer. The entire length will be 18 feet. No ramp either, which will throw Terra for a loop until she gets used to it. The old WW is the only trailer I've owned since we brought Terra home. She has been in two slant loads over the years with step downs, so hopefully it won't take much to get her used to this one. 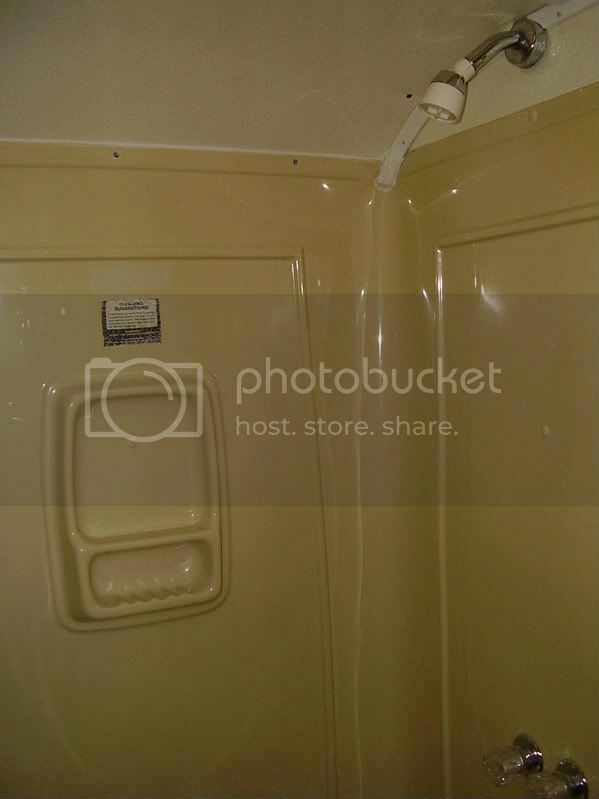 Also, mine will have a camper door instead of a drop bar. EZ & I looked at a similar trailer at the HHF. 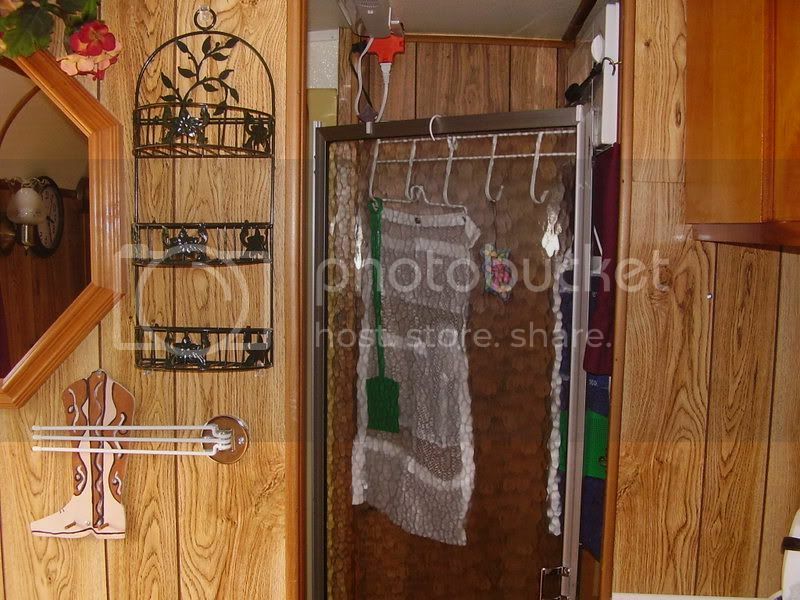 The door on that trailer could be opened and closed from the inside, but I didn't like that drop bar on the outside. I could just imagine sleeping in it and someone locking me in! Great suggestion Hook. I'll keep that in mind. 'Plash; I stole that idea from EZ. After camping with her the last couple of years, I just knew if I got the chance I'd do that, too. Also, I've been camping in that cramped dressing room in the WW for quite some time . Homein3turns; I was told it should be delivered in 8 weeks from the time I ordered it, which was April 12th. So I'm thinking around that date in June at the latest. You hang it there Beth. You're going through some rough times right now, but things will get better. You'll see. Just keep faith in the Almighty. He got us through our rough times just fine. You're time will come. Congrats, RH! Corn Pro DOES make a good trailer. I had mine for 11 years, and never had a bit of trouble with it. For the money, it was much better made than my American Spirit! Just having an area where you can put a bed, makes all the difference. 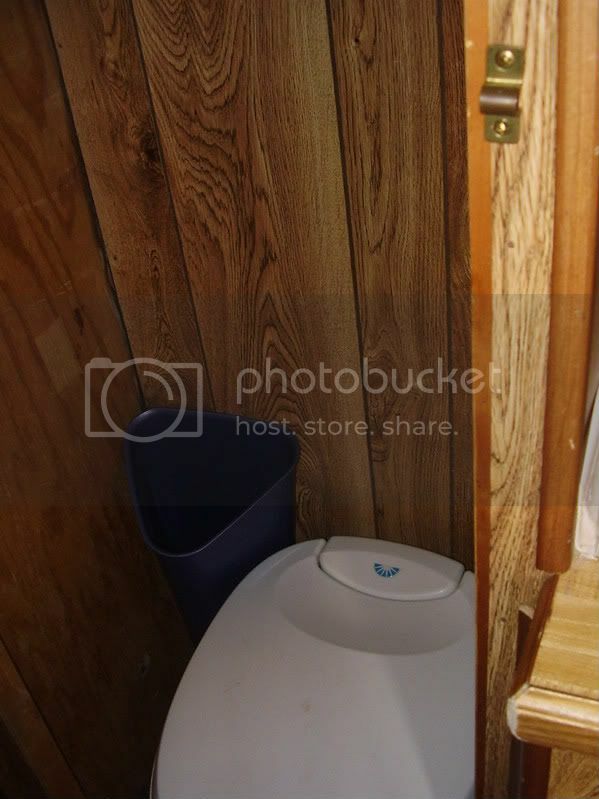 You can set it up the way you want it, and leave it that way through camping season. Every morning I go out to take care of the horses and find myself looking at that old WW horse trailer. I might not be looking at it in another 4 weeks. 4 WEEKS! That still sounds like a long time to wait. I'm hoping the weather will hold so I can go to Salamonie this Sunday. Been a lot of thunderstorms and rain around here the last two or three weekends. My yard was over a foot long when I mowed it last Monday! The whole thing is that I still have to haul Terra in the old trailer, and to make matters worse, I'll be camping in it at MTR over the weekend of May 22 & 23. That's the annual Ladies Ride at Blackwell, which is right around the corner from MTR. Sorry to say that MTR has spoiled me when it comes to camping, and this ride is notorious for bad weather. Blackwell is completely primitive with no electric or running water. I just know that I'm going to be finding fault with my old trailer that entire weekend. It was the same with me, 3 years ago; I had to camp in my old trailer several times, while waiting for the new one, and it was frustrating! But well worth the wait! One last camping trip in the old WW, and then things will be much better for you! Looking forward to new trailer pictures.